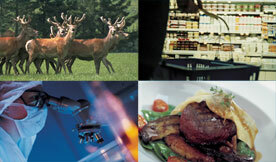 The New Zealand deer industry's major research website. This website provides information on DEEResearch and, for registered users, allows unlimited access to hundreds of research papers and a large amount of other deer research information. View rankings of breeding values for the major traits 12-month weight and mature weight for selected sires. Learn how to estimate the extent of Wapiti features in young red deer and wapiti crossbreds. Use the Stag Selection Manual to assist with decisions about stag purchases and breeding. Use the search tools in the Research Papers section to see what's available or to pin-point specific information you need. The database of research papers was developed with funding support from MAF's Sustainable Farming Fund. Check out the progress of current research projects. There's a wealth of other information on DEEResearch, its research programme and materials such as annual reports etc. Check out other sites we think you might be interested in. Email us if you have any comments on this site, or if you have deer research needs or ideas. If you need help using the site or registering for access to the research papers, you can contact DEEResearch by email or call (04) 473 4500.